Music from the American South has made an indisputable impact on culture and politics in the U.S. and around the world. But who are the South’s most prominent and influential voices today? How are they creating the “southern” in their sounds and speaking to broader matters of national and international importance? In what ways do they build on the sounds of the past or provide the soundtrack for our common and divided present? The Southern Music Symposium will address such questions and more. 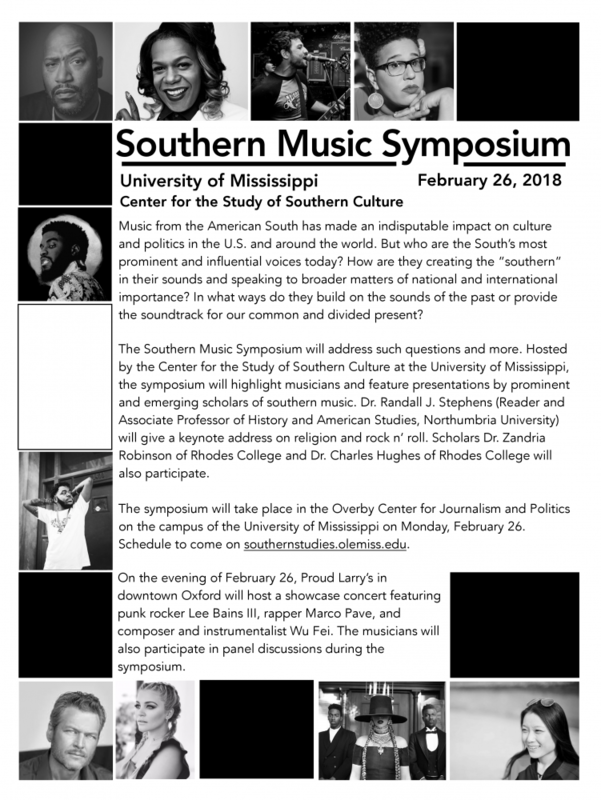 Hosted by the Center for the Study of Southern Culture at the University of Mississippi, the symposium will highlight musicians and feature presentations by prominent and emerging scholars of southern music. Dr. Randall J. Stephens (Reader and Associate Professor of History and American Studies, Northumbria University) will give a keynote address on religion and rock n’ roll. Scholars Dr. Zandria Robinson of Rhodes College and Dr. Charles Hughes of Rhodes College will participate in a roundtable discussion, and UM students will present their research on southern music and culture. The symposium will take place in the Overby Center for Journalism and Politics on the UM campus on Monday, February 26. That evening, Proud Larry’s in downtown Oxford will host a showcase concert featuring punk rocker Lee Bains III, rapper Marco Pave, and composer and instrumentalist Wu Fei. The musicians will also participate in panel discussions during the symposium. The Symposium and Show Are free and open to the public.